A sheet of approx 180 self adhesive craft pearl gemstones of varying sizes. Perfect for creative touches to craft work. Varying gem sizes: 5mm, 4mm and 3mm. 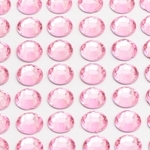 A sheet of approx 180 self adhesive pink craft gems of varying sizes. Perfect for creative touches to craft work. 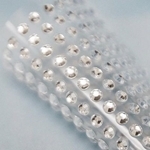 A sheet of 48 self adhesive diamond rhinestone craft crystals of varying sizes. Perfect for creative touches to craft work.